"In 1861 London, Violet Morgan is struggling to establish a good reputation for the undertaking business that her husband has largely abandoned. She provides comfort for the grieving, advises them on funeral fashion and etiquette, and arranges funerals. Unbeknownst to his wife, Graham, who has nursed a hatred of America since his grandfather soldiered for Great Britain in the War of 1812, becomes involved in a scheme to sell arms to the South. Meanwhile, Violet receives the commission of a lifetime: undertaking the funeral for a friend of Queen Victoria and Prince Albert. But her position remains precarious, especially when Graham disappears and she begins investigating a series of deaths among the poor. And the closer she gets to the truth, the greater the danger for them both…"
I've recently become re-obsessed with the Victorian era and was eager to snap up Lady of Ashes. Another plus is the fact that Christine Trent and her books are wonderful! The entire concept of a female undertaker in 1861 was fascinating. Victorians were notably obsessed with death, but a female in this profession would have been quite odd. Our MC is Violet, who has married into the undertaking business but her husband is a bit of a deadbeat which leaves Violet in charge. When she discovers a string of mysterious deaths and sets out to investigate, Violet finds herself in some crazy scenarios (a train crash, overseeing Queen Victoria's husband's funeral, some sort of American gang scheme, and fighting a tiger). Despite all of this, she still is a very believable character (yes, even the tiger). You sympathize with her as a woman struggling against social norms and trying to survive after her husband disappears. Christine Trent's books seem to all follow the same exact pattern, yet with fresh and lively characters and locations for each book. As Lady of Ashes is set in the time period of the Civil War, it was interesting to get a British perspective of the American war. Every now and then I would get disoriented with the constant jumping around from character to character, but each offered a fresh viewpoint. If you are interested in the Victorian era like me, Lady of Ashes gets us a good glimpse into the life, customs, and people of the time. It was an adventure from beginning to end! This is the first in a mystery series and I am excited to see where the next book begins. I have a copy of Lady of Ashes to give away to one of you! To enter, simply leave a way to contact you in a comment below. You have until March 6th to enter. USA only, please (I'm a poor college graduate!). Oooh, this one sounds intriguing. I'd love to read it. Thanks for the giveaway! I have been wanting to read this for a while. Thanks for the giveaway! This is on my wish list; thanks for the giveaway! This sounds so good! 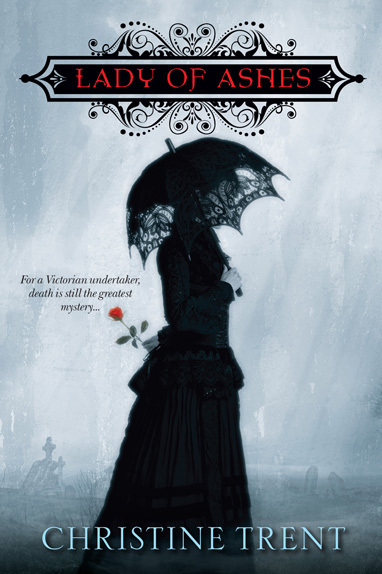 A female undertaker in Victorian England...come on!!! Thanks for the chance to win a copy! I love reading about the Victorian era and this one is specially interesting because the main character is an undertaker!! Thank you for this great giveaway. I saw this book on goodreads a while back and I knew I had to read it. It has a very interesting story line. Sounds like a great book! I'd love to win a copy! My email address is lwolfsf at sbcglobal dot net. Thanks! I love mysteries, but I haven't read a historical one in a long time. This one sounds wonderful and so very interesting. Thanks for the chance to win it. The characters here are just so interesting. It sounds like a great read and I'd love to win a copy. Thanks. Everytime I see an email from The Broke and the Bookish, I think The Young and the Restless. This sounds like a great read! Thanks for the opportunity. Oh this sounds lovely! It reminds me a little of one of Ann Rinaldi's book....the title escapes me at the moment haha so that is a useless comment. Thanks for the review and the giveaway, it's on my TBR! sounds like something i have to read!!! & i love the cover!!! simply ashes seems lively and fun! I love the Victorian Era too! After this review, I'm looking forward to read this book. Btw, the cover is beautiful. Love it! Love the sound of this Book please enter me! Love the cover! Beautiful and mysterious! If it is not too late I would love to enter my name! Kennedy.lisa.11@gmail.com.